The increased prevalence of carbapenem-resistant Gram-negative isolates caused by Metallo-β-lactamase (MBL) is worrisome in clinical settings worldwide. The mortality rate associated with infections caused by MBLs producing organisms ranging from 18 to 67%. This study aimed to determine the prevalence of Metallo-β-lactamase genes among some Gram-negative clinical isolates (Carbapenems susceptible and resistant). This paper describes a descriptive cross-sectional study carried out to detect MBL genes such as (blaVIM, blaIMP and blaNDM) by multiplex PCR mixture reaction among 200 Gram-negative clinical isolates (Citrobacter spp, Escherichia coli, Enterobacter spp, Klebsiella pneumoniae, Pseudomonas aeruginosa, Proteus mirabilis, Proteus valgaris). Khartoum hospitals during 2015 to 2016. Limitation: The study organisms were not evaluated for non-MBL carbapenemases, such as KPC and OXA-48. The prevalence of MBL genes by multiplex PCR assays among 200 Gram-negative clinical isolates was 72(36.1%). MBL positive genes among 100 carbapenems sensitive and 100 resistant isolates were 27(27%) and 45(45%) respectively. There was a statistically, significant association between the antimicrobial susceptibility and the presences of MBL genes (P.value = 0.008). E.coli was the predominant species possessing MBL genes 26(36.1%), with 22(30.7%) species having a combination of MBL genes. Verona integron Metallo beta-lactamase (VIM) was the most frequent genes 28(38.9%) out of 72 MBL detected genes, followed by imipenemase (IMP) was 19(26.4%), and consequently, New Delhi Metallo beta lactamase was 3(4.2%). This study revealed a high prevalence of MBL genes in some Gram-negative isolates from Khartoum State Hospitals which were not previously established in these hospitals. The production of hydrolytic β-lactamase enzymes is the most prevalent resistance mechanism towards β-lactam antibiotics [1, 2]. Metallo-β-lactamases constitute a worrisome group of enzymes, since they present a broad spectrum profile, hydrolyze penicillins, cephalosporins and carbapenems [1, 3], but not monobactams e.g. : aztreonam [4–7]. Carbapenem antibiotics are currently used as the last resort for treatment of the infections caused by multidrug-resistant Gram-negative bacteria [5, 7–9]. The mortality rate associated with MBL producers is reported to be from 18 to 67% [5, 6]. The most prevalent families of MBL resistant genes worldwide are IMP (inactivate imipenem, first reported in Pseudomonas aeruginosa strain from Japan in 1988) . While the VIM (Verona Integron-encoded Metallo-β-lactamase) gene was first found in Europe, then emerged in other countries [7, 10]. However, NDM-producing bacteria were first isolated from a Swedish resident who contracted a urinary tract infection caused by carbapenem-resistant K.pneumoniae while he was in New Delhi in late 2007 [11–13]. Furthermore, the NDM gene later emerged in Pakistan, Indian subcontinent and the United Kingdom. Moreover, it represents a serious threat of rapid dissemination of multiple antibiotic resistance [4, 12, 14]. Furthermore, the easy and rapid dissemination of acquired MBL within a bacterial species is a major issue regarding the treatment of individual patients and confronting infection policies . In a study done in Khartoum, Sudan late 2012 by Abdelrazig and his colleague among 74 clinical isolates of Pseudomonas aeruginosa, 57 isolates were recognized to have IMP family genes (IMP-7 and IMP-10) using PCR assay . Jamal W et al, (2013), reported in a study conducted in Mubarak Alkabeer hospital, Kuwait. There, out of 14 isolates of Enterobacteriaceae collected from intensive care units, eleven isolates produce VIM-4, and three isolates produced NDM-1 . The study reported here aimed to detect (blaVIM, blaIMP and blaNDM) Metallo-β-lactamase genes in Khartoum state. This was a descriptive cross-sectional study, carried out during January 2015–December 2016 at different hospitals, Khartoum State. A total of 200 samples of Gram-negative clinical isolates only susceptible and resistant to carbapenem antibiotics such as meropenem10μg and imipenem10μg were taken as part of the routine clinical procedure and stored for future analysis during six-month period from April 2015 to October 2015 from (Khartoum Teaching Hospital, Khartoum Pediatric Hospital, Omdurman Pediatric, El Blok Pediatric hospital, and Omdurman Medical Army Hospital) in Khartoum, Sudan. These strains were isolated from urine, wound swabs, sputum, blood, tissue aspirates, ear swab, and CSF samples. Furthermore, the isolates were sub-cultured on cysteine electrolyte deficient (CLED) agar (HiMedia, India), and their identification was performed by biochemical tests such as oxidase test, Kligler iron agar (KIA), Indole test, citrate utilization, urease test and motility test. Susceptibility to antibiotics was determined by Kirby-Bauer disk diffusion on Mueller Hinton agar (HiMedia, India). Ordinarily, the tested isolates were picked up with a sterile wire loop and suspended in peptone water (Mast Group, UK). In a good light, the turbidity of the suspension was prepared equivalent to 0.5 McFarland’s standard. A plate of Mueller Hinton agar was inoculated with the suspension using a sterile cotton swab. The swab evenly over the surface of the medium was streaked and meropenem (MEM) 10 μg and imipenem (IPM) 10 μg antimicrobial discs were placed. The plate was incubated aerobically at 35 °C for overnight [18, 19]. The inhibition zone diameters were measured by (mm) according to Clinical and Laboratory Standards Institute (CLSI) guidelines (2011) . Thus, in this study carbapenem resistance was defined as testing non –susceptible to either meropenem and/ or imipenem. However, carbapenem susceptibility was defined as testing susceptible either to meropenem and/ or imipenem. Two strains were detected as intermediate and they considered resistant because the value of intermediate breakpoint was closer to the breakpoint of resistant. MBL genes including (blaVIM, blaIMP and blaNDM) were screened among all isolates by multiplex polymerase chain reaction (PCR). Consequently, total DNA targeting both genomic and plasmid DNA was extracted with chloroform/ isopropanol chemical method. Specific primer for target DNA (MBL genes) designed by (Metabion/ Germany). IMP-F: (5ʼGGA ATA GAG TGG CTT AAC TCT C 3ʼ) and IMP-R: (5ʼ CGA ATG CGC ACC AG 3ʼ) 232 bp. VIM-F: (5ʼ TGG TGT TTG GTC GCA AT 3ʼ) and VIM-R: (5ʼCGA ATG CGC ACC AG 3ʼ) 390 bp. NDM-F: (5ʼ CGG AAT GGC TCA TCA CGA TC 3ʼ) and NDM-R: (5ʼ GGT TTG GCG ATC TGG TTT TC 3ʼ) 621 bp. Every organism of the study population was tested with the three different primers in a single test. Multiplex PCR amplifications were carried out in 20-μl volume containing 9-μl dH2O, 4 μl PCR Master Mix (Solis BioDyne, Estonia) ready to load, 3 μl of the three primer mixtures and 4-μl DNA template. The PCR amplifications were performed by thermo-cycler machine (TC-412, UK), using the following cycling parameters: one cycle (initial denaturation) 2 min at 95 °C, 30 cycles (denaturation) 30 Sec at 95 °C, 30 cycles (annealing) 30 Sec at 48 °C, 30 cycle (elongation) 30 Sec at 72 °C,and 2 min (final extension) at 72 °C. 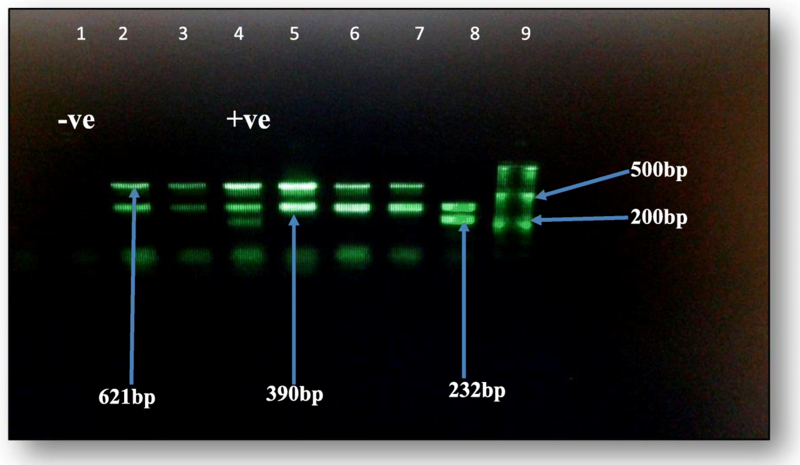 Moreover, the PCR product was resolved using 1.5% agarose gel electrophoresis to detect specific amplified product by comparing with standard molecular weight marker 50 base pairs (DNA ladder). Data (Additional file 1) were analyzed by the Statistical package of social sciences (SPSS) programmed for Windows, version 16. Different bacterial species were studied. Most were E.coli 71(35.5%) followed by Pseudomonas aeruginosa 54(27%), and less predominant organisms were Citrobacter spp and Enterobacter spp 1(0.5%) each, (Table 1). The overall results revealed that 72(36.1%) from 200 clinical Gram-negative isolates, were positive for one or a combination of MBL genes. Consequently, MBL positive genes among 100 carbapenems sensitive and 100 resistant isolates were 27(27%) and 45(45%) respectively, the analysis showed statistically significant (P.value = 0.008) between carbapenem susceptibility and MBL genes (Table 2). The MBL genes were heterogeneously distributed among the different species of Gram-negative isolates, with 22(30.7%) species having a combination of MBL genes. Moreover, E.coli was the predominant species possessing MBL genes 26(36.1%) (Table 3). Verona integron Metallo beta-lactamase (VIM) was the most frequent gene detected in 28(38.9%) out of 72 positive MBLs genes, then, imipenemase (IMP) detected in 19(26.4%), and NDM reported in 3(1.5%) (Table 4). Three possible Metallo β-lactamase (MBL) resistant genes (blaVIM, blaIMP and blaNDM), which detected in this study using PCR were illustrated on an agarose gel according to their amplicon size (Fig. 1). Metallo-β-lactamase has emerged as a powerful resistance determinant in Gram-negative bacteria [20, 21], causing health problems of global dimensions [22–25] which can threatens human being with their newly built genetic structure , and play a principal role in drug resistance [22, 26, 27]. In general data on the dissemination of antimicrobial genes on sub-Saharan Africa is scarce, especially regarding the prevalence of MBL genes . To our knowledge, this is not the first report of the presence of MBL encoding genes in Khartoum state, Sudan, a number of studies have been carried out, including a detection of IPM types in Pseudomonas aeruginosa performed by Abdelrazig and her colleague , NDM mediated carbapenem resistance was recently described by Mohamed et al. . In addition to (TEM, VIM, IMP, SHV, CTX, and KPC) antimicrobial resistance genes among Gram-negative isolates were determined by Satir et al. . By contrast, there are no published data regarding (IPM, VIM and NDM) carrying bacteria have been described in other regions of Sudan. We believe this study represents the first report of the prevalence of (IPM, VIM and NDM) MBL encoding genes among Gram-negative isolates in Khartoum State, Sudan. Furthermore, reports of emerging (IPM, VIM and NDM) MBL genes among Gram-negative strains have been published worldwide, including sub-Saharan Africa and Middle East countries such as Ethiopia , Kenya , Uganda , Egypt , South Africa , Saudi Arabia , Iraqi , Kuwait , and Lebanon . MBL genes prevalence among carbapenem-resistant isolates was found 45(45%) out of 100, which agrees with MBL genes prevalence from Tanzania, Romania, India and Egypt by Mushi , Mereuţă et al, , Amudhan et al, , and Nelly, et al., , they reported 42%, 46(43.4%), 92(51.4%) and 12(52.2%) respectively. This is a worrying result, probably due to the unjudged antibiotics use patterns in these countries. However, our results were higher than studies conducted in Malaysia, Egypt, Uganda and Iraq by Khosravil  Zafer et al, , Okoche , and Anoar et al , they found 36, 31.3, 28.6%, and 39(22%) the prevalence of MBL genes respectively. MBL genes prevalence among carbapenem sensitive isolates were found 27(27%) out of 100, this finding was higher than that found by Anoar et al, in Iraq, 7(3.9%) , ordinarily, MBL genes presence among carbapenems sensitive strains indicate that there might be a hidden MBL genes not detected by phenotypic tests, leading to the silent spread of these genes in the hospitals and the community. This study revealed that MBL genes prevalence among carbapenem-resistant and sensitive isolates was (36.1%), which was agreed to that reported in Iraq, and Iran by, Anoar et al, , Aghamiri et al,  were 46(25,9%), and 90(42%), respectively. The difference may be due to the variation of geographical circulating strains. Verona integron Metallo-beta-lactamase (VIM) was the most frequent gene represent 28 (38.9%) among 72 positive MBL genes, imipenemase (IMP) represent 19 (26.4%), and the NDM was the least detected in 3(1.5%). Our results agree with studies done in Uganda, Tanzania, Egypt and Iran by Okoche et al,  Mushi , Zaferet al,  and Aghamiri , they reported the frequencies of (VIM, IMP and NDM) as: [21(10.7%), 12(6.1%) and 5(2.6%)], [34(15%), 28(12%), and 9(4%)], [58.3, 4.2 and 2.1%] and [70(33%) and 20(9%)] respectively. However, our findings were disagrees with that found in Iraq by Anoar et al, (4) they reported IMP was the most frequently detected gene 33(18.6%), VIM 19(10.7%), and NDM 2(1.12%) isolates. E.coli was the most isolate harbours MBL genes 26(36.1%), followed by Pseudomonas aeruginosa 23(31.9%). Moreover, 22 isolates have harboured a combination of MBL genes. These findings disagree with Okoche et al, study, where K.pneumoniae was the most frequent MBL genes harbour 35(52.2%), and then 19(28.4%) E.coli, and 8 isolates of MBL genes positive harboured a combination of MBL genes similar to our findings . This study revealed a high prevalence of MBL genes in some Gram-negative isolates from Khartoum State Hospitals, all the three genes assayed (blaVIM, blaIMP and blaNDM) were detected in the study samples. Detection of MBL genes among isolates which reported as sensitive to carbapenem was acting as a reservoir of such resistance genes with potential risk for the silent spread of these genes in hospitals and community. This is the first report of the prevalence of (VIM, IMP and NDM) MBL genes in Gram-negative strains in Khartoum State, Sudan. We recommend a regular screening and monitoring system should be set up to prevent the dissemination of these genes in the country. We do acknowledge the efforts of Mr. Mohammed Alfatih, Miss. Hadeel Ismail and Miss. Nafisa Ahmed (research laboratory and medical laboratory department, Faculty of Medical Laboratory Sciences, Al Neelain University) for their technical support. The study was supported partially by the Faculty of Medical Laboratory Sciences, Al Neelain University, Sudan. Funding body has no role in the design of the study, collection, analysis, and interpretation of data and writing the manuscript. The data analyzed during the current study are presented within an additional spreadsheet file. MAA, designed, conducted the study and drafted the paper. WIE coordinated the laboratory quality control, revised and approved the manuscript critically for important intellectual contents. All authors read and approved the final manuscript. The study was based on laboratory work performed with bacterial strains isolated from patient’s samples during regular hospitals work up. Ethical clearance is not required for the work with isolated bacteria in Al Neelain University. Okoche D, Asiimwe BB, Katabazi FA, Kato L, Najjuka CF. Prevalence and characterization of Carbapenem-resistant Enterobacteriaceae isolated from Mulago National Referral Hospital, Uganda. PLoS One. 2015;10(8): e0135745. https://doi.org/10.1371/journal.pone.0135745.